An open window with a little flowerbox. 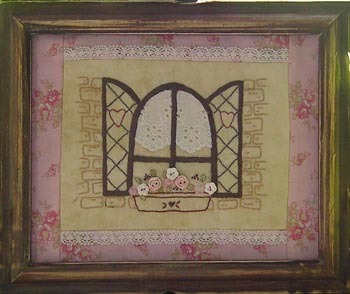 Pattern includes two small rose buttons and three white forget me knot hand made buttons and lace for curtains. When completed will fit a frame opening 8" x 10". Pattern includes diagram for tracing designs and instructions. Pattern does not include frame, fabrics, cottons, lace for borders etc.